The teleférico (air tramway) is coming to Rocinha, a benefit or burden? This piece is based on participant observation (mainly in Rocinha), authorized recorded interviews, literature reviews, etc.… No names or compromising details will be disclosed. Well, it is official, the teleférico (air tramway) is coming to Rocinha very soon, at least the work will begin soon. Actually it has been official for some time now, but the project has gone public recently and will soon be authorized and signed by Dilma Rouseff, President of Brazil. The teleférico is part of the PAC 2 project in Rocinha. PAC 1 was never finished (http://oglobo.globo.com/rio/na-rocinha-construcao-de-planos-inclinados-creches-mercado-esta-parada-2714033). Roughly 65% or 70% of the work has been completed and yet the public authorities managed to spend over their initial budget by about 35%. Of course PAC 1 was complicated by the presence of the heavily armed drug traffickers, who everyone knows were part, not the only part, but a major part, of the ring of people who stole and misused used public money. The new synthetic grass football pitch and surrounding sports related facilities built in the Vila Verde section of Rocinha for the drug traffickers is but one example (See mention in Ruth de Aquino’s interview with Nem, Rocinha’s drug kingpin, in the Revista Época). It was built with PAC 1 material but had nothing to do with the original plan. At least today it is being used for sports programs for local youth. Also, a careful look around the community will reveal a number of houses and buildings some that belong, or belonged, to the traffickers, others that belong to people or associations in their circle of corruption, that were built or augmented with resources and money from PAC 1. Indeed, a upper level public bureaucrat who was responsible for PAC 1 in Rocinha as well as a high ranking member of the State’s public security apparatus suggested that PAC 1 was rushed for political reasons (before elections to get certain people elected) and that it would have been much more successful and less costly (Because of all the money the drug-traffickers and their associates stole) if the UPP had been established first. The traffickers are surely not the only ones who participated in misuse of public funds during PAC 1, there are certainly many non-residents who profited, as with most enormous infrastructure projects, money always goes missing. It is just easier to see that money was stolen by certain residents/association in the community because most of it was re-invested back into the community for, but not for the public. So, now PAC 2 is to begin, and it will cost 1,6 billion reais. It is going to be the transformation of Rocinha, if it actually takes place according to plans. It is a massive community development initiative that intends to drastically modify daily life in Rocinha. Anyone who lives in Rocinha knows that certain issues need to be drastically modified, number one being Rocinha’s roughly 28 open sewages. The problem with sanitation in Rocinha is shameful, it is an absolute disgrace in 2013 in the city that is about to host a series of international mega-events, and even if there were no events planned it would be a shame, because there is no reason for such a precarious sanitation situation in Rocinha, not with all the money being invested in the community since 2007. Certain active residents remain dumbfounded about the issue with sanitation. Because of Rocinha’s topography and the fact that it is the densest favela in Brazil, and arguably the largest, it’s problems with sewage and sanitation are beyond daunting. This is why so many active residents are skeptical about the teleférico. If the sanitation issues can be addressed, and other health and education issues, then resident’s would not be so weary of the teleférico, but the teleférico is extremely expensive to build, and to maintain, and many residents wonder if it is more for tourists to see Rocinha from above than for residents who have to smell the raw sewage below. 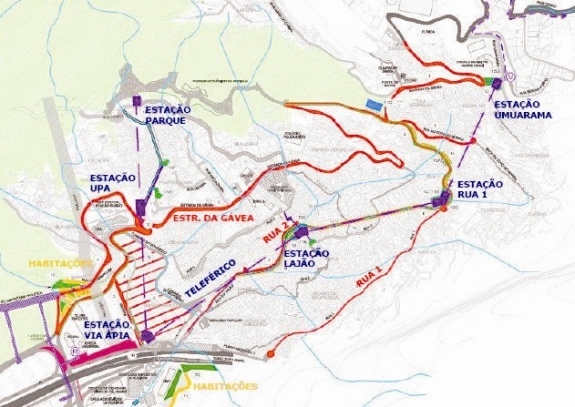 Below is the plan for Rocinha’s teleférico that was recently released. Another high level public bureaucrat admitted to Mundo Real in a recorded interview what most activists and inquisitive residents already knew, that the teleférico was a 100% top-down project. There was zero community involvement in deciding upon it. The public authority told us it was copied from Medellín, which a lot of people know, and experimented first in the Complexo do Alemão favela in the North Zone. The state government thought it was a success so they planned one for Rocinha as well. There was and still is a lot of resistance there to the teleférico in Complexo do Alemão, with the media praising it and with many residents weary of it. In late 2012 a few members of Rocinha’s Cultural Forum, a group that works in partnership with Mundo Real, Rocinha sem Fronteiras and the Museu Sankofa da Rocinha. The members rode the entire teleférico system in the Complexo do Alemão and were not impressed, they also interviewed and spoke with dozens of residents there, no one really seemed to have much praise for it, the main reason being that, yeah, it is cool, but there are so many pressing issues in the favelas, why build a colossally expensive carousel in the sky for visitors? Well, one PUC-Rio scholar, who we will also not cite because of how politicized this issue is, argues that unlike Favela-Bairro which made a lot of minor but important improvements in the slopes and alleyways of dozens of favelas (mainly smaller communities) PAC seems to aim for large scale projects that can be seen from above and beyond the favelas. It seems to really be geared towards highly visible and ostentatious projects that seem to be announced and publicized strategically around certain elections. The roughly 8 million dollar pedestrian bridge that links Rocinha to the Sports Complex (also PAC 1) located in São Conrado is one example. In closing this rather erratic post, yes, Rocinha’s residents want PAC 1 and PAC 2 and even the UPP for that matter. But residents also want to be able to participate considerably more in the process of developing their community. This, along with corruption, seems to be among the most serious problems with these massive scale development programs/projects. The lack of participation is much more than a question of political correctness, it is a question of appropriate use of public funds, and making sure they are spent on the issues most pertinent to healthy community development, which only residents can truly understand. More to come soon.